Montreal, 5th December 2018, Santa Claus completes his annual driver training at Virage Simulation. 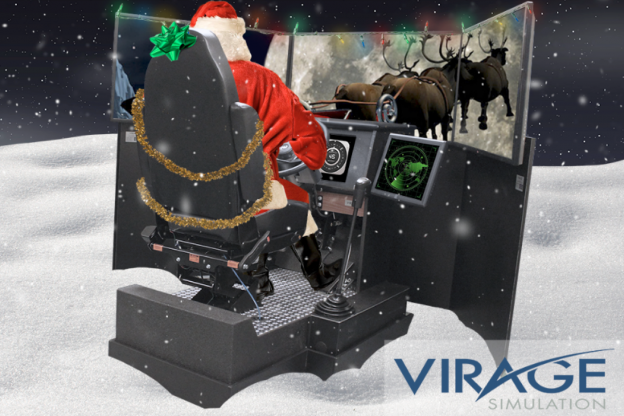 Santa Claus had just completed his recurrent driver-training program on the Virage Simulation VS600M truck simulator when he met with our reporter to share his experiences. “You know, as a seasonal worker who only gets out once a year, my skills get rusty. I need some refresher training to prepare for those big deliveries.” Snowplow operators have this in common with Santa. After the long summer and fall, they need to prepare for winter but there is no snow to plow. When the snow arrives, it`s too late. Ready or not, they need to get out there to clear the roads. Luckily, Virage has a solution. When asked about trip planning, Santa became evasive. “I can’t say much about that but I do travel from east to west to gain some time.” When questioned about Hours of Service, Santa went totally silent. Have a good one, Santa.